Current events note: Concerning the president of the USA, talk is cheap, but that man is in the arena verbally bruised and battered and he has experienced the highs and lows of high achievement. Which is something all of these armchair genius talkers instead doers will never understand. And he could never have become president in the first place against almost impossible odds without great wisdom and self-control over his emotions. This writer trusts him over any shallow-minded emotional do-good liberal any day. Folk, all of this constant negative yap, yap, yaps, by these shallow minded liberal TV networks are not entirely harmless. Good positive minds are being poisoned. Any constant barrage of negative, hateful, and destructive yapping will poison any good mind that listens long enough. The mental and physical always tries and will merge given time. You can't constantly listen to hateful negative stuff without at some point start believing it. I love liberals, this would be a bleak dreary world without liberals always searching for a cause in their own shallow way to do good, make something better, to help someone, and to save Bambi and all of God's creatures. The problem is they don't seem to have that internal moral gauge that regulates when to stop or when enough is enough and they will push on and on deeper and deeper into sheer insanity to no end. That is why all down throughout history only the "Iron Fist" ruled, this thing we call individual freedom on a mass scale is a new frontier beginning with the USA. 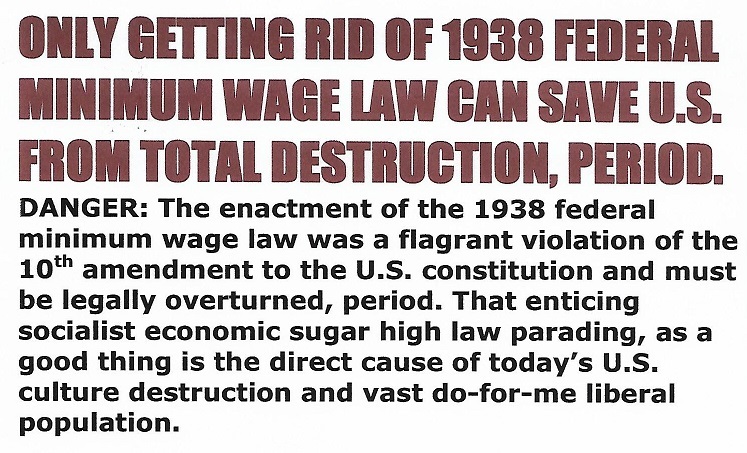 That is why the ignorance of enacting the 1938 minimum wage law must be forgiven and quickly repealed. That unknowingly destructive 1938 minimum wage law removed the necessary societal discipline barrier that kept liberalism under control, which for the first time in history allowed individual freedom to the people on a mass scale. But, I have serious doubt that the USA will ever recover from enacting the 1938 federal minimum wage law that disarmed and killed the purging power in our U.S. economy. But, miracles do happen, and especially if that God forsaken 1938 law is finally repealed.